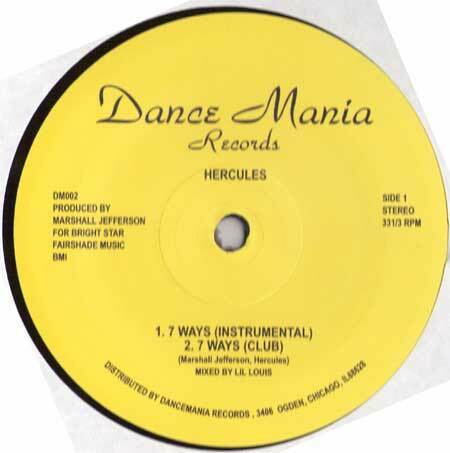 In the first of many, we would like to put the spotlight on influential record labels, starting with one of Chicago’s institutions, Dance Mania. Producing most of his work under alias Parris Mitchell & Victor Romeo, Mitchell teamed up with four piece house group Reggie Hall to create Work It 94. Hercules is one of six known aliases for Marshall Jefferson. This was Dance Mania’s second record, released in 1986. Another Chicago house staple, Wallace was a Billboard Magazine Club Reporter and music buyer at the iconic record store Imports Etc. Resident at many of Chicago’s infamous house clubs including Heroes, The Riviera & The Warehouse, Wallace produced his first track, House Has Taken Over Me in 1989 and has featured in several other projects such as Ecstacy, Black Ice Productions & The Shermanians. Our pick from this release is the Acid Mix; with vocals by Eric Duke & gurgling 303 acid lines, it’s timeless. Two Men On Wax are Paul Johnson & Louis Bell, both well known producers in their own right, released five EPs under this alias between ’94 & ’95. You might recognise the popular sample in Get You Some More; The original was Let No Man Put Asunder by American disco trio First Choice, released in 1984. It has also been used by German producer Butch in his track No Worries.